20 Massive problem with his image, literally. 27 His son ? Really ? 29 Why is his Gold/Silver/Crystal pokemon on another page? i think the original japanese you guys have in here for silver its not the right one cause while i put it in pokeani it appeared richie. Sketch: Even if we don't replace the main image, shouldn't we add the scan with the redesign somewhere in the article? Quote: "Giovanni and Silver's relationship is revealed in HeartGold and SoulSilver if the player brings a promotional Celebi to the Ilex Shrine in Ilex Forest. Celebi takes the player back in time three years to witness Giovanni abandoning Silver to go into seclusion because of his defeat. Silver's hate for Team Rocket apparently stems from them failing his father." This page's introduction is kind of confusing. When I first read it, it sounded like the Fame Checker referenced Special and "Silver's dark demeanor" along with the red haired child clue. I'd edit this myself, but wanted to ask if this was just me or if other people also find the sentence structure confusing. Here's the sentence as it is now: Prior to the release of Pokémon HeartGold and SoulSilver, fan speculation held that Silver was Giovanni's red-haired child, due to Pokémon FireRed and LeafGreen's Fame Checker's many references to Pokémon Gold and Silver versions, to Giovanni being Silver's manga equivalent's father in Pokémon Special, and to Silver's dark demeanor and detestment of Team Rocket. And here's how it could be changed: Prior to the release of Pokémon HeartGold and SoulSilver, fan speculation held that Silver was Giovanni's red-haired child, citing as evidence Pokémon FireRed and LeafGreen's Fame Checker's many references to Pokémon Gold and Silver versions, Giovanni being Silver's manga equivalent's father in Pokémon Special, and Silver's dark demeanor and detestment of Team Rocket. A sidequest in Pokémon HeartGold and SoulSilver later proved the theory true. Shiningpikablu252: Oh, come on! You said yourself that Leaf should be mentioned in the FR/LG section of the timeline article but not in the G/S/C/HG/SS section because she existed on FR/LG but not on the G/S/C/HG/SS timeline. Now you're contradicting yourself by mentioning her in an article that is about a GSC character, and therefore, it's about the GSC timeline (especially considering that the part I edited was talking about a line said by Giovanni in HG/SS, not FR/LG, so he was clearly talking about Red). What's up with that? 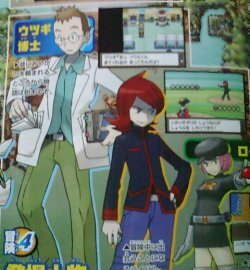 Furthermore, Red's team at Mt. Silver is based primarily on other forms of Pokémon media, primarily Ash from the anime, but also in Generation II from Red in Pokémon Special (this would explain Espeon). As far as we're concerned, if the depiction of Red is not fully video-game-based, then nobody has a place to say that Leaf has absolutely no place in canon simply because Red's there and Leaf's not. "If the fact that Red appears in Mt. Silver and Leaf doesn't appear at all were enough to outright suggest that only one of them can exist in canon, then there wouldn't even be any canonicity debates to begin with." The point is - Leaf's story from FR/LG isn't canon. Red and Leaf can't both be the kid who defeated Team Rocket and became the regional Kanto champion in the same continuity. "However, the one and only text reference in the original Generation II games that explicity implies Red came from Copycat, something that can easily be changed to be gender-neutral in a remake. Even back in Generation II, they said Team Rocket was broken up three years ago by "a kid", which in Genration IV context would imply either Red or Leaf." If that was the case, I wouldn't have a problem with leaving the kid's identity's ambiguous. However, you're wrong. Blue stated that he was defeated by Red (yes, he mentioned his name) after he became champion when you meet him in Cinnabar Island. "Furthermore, Red's team at Mt. Silver is based primarily on other forms of Pokémon media, primarily Ash from the anime, but also in Generation II from Red in Pokémon Special (this would explain Espeon). As far as we're concerned, if the depiction of Red is not fully video-game-based, then nobody has a place to say that Leaf has absolutely no place in canon simply because Red's there and Leaf's not." Not really. Special Red's team was based on GSC Red's, not the other way around. GSC and HG/SS Red's team is based on the four Gen I starters (Pikachu, Venusaur, Charizard and Blastoise) and Pokémon that Red canonically met in Gen I (he got Eevee from that man in Celadon, Lapras from that Silph scientist, and Snorlax when he met it blocking the path to Fuchsia). The only part of HG/SS Red's team that is a reference to other media is Pikachu, as it has the same moves as the anime Pikachu. "In closing: The Leaf mentions stay. To remove them would imply that the Generation I games were the one and only proper canon for the three-years-ago story, and that FireRed/LeafGreen themselves are non-canonical, and that in turn would put some doubt on HeartGold/SoulSilver's canonicity. Whether the Leaf mentions remain in the current wording or not, that remains to be seen." "if you play as Kotone and Leaf will appear instead"
Kingofall42 10:20, 10 October 2009 (UTC) there you go. Massive problem with his image, literally. His son ? Really ? Why is his Gold/Silver/Crystal pokemon on another page? This is then confirmed when you speak to the police officer who asks for ??? 's name. When you answer with the correct answer, ?? ?, the cop accepts your correct answer and lets you continue with the game. ??? is then identified by his canon name, ?? ?, throughout the whole game for decades. This is still the case on my original copies of both Pokémon Gold AND Pokémon Silver - and yours too if you played it right and the batteries didn't die. Frankly, this whole Gnohio thing seems like you and/or your friend making something up and seeing if you can get Bulbapedia to accept it. You come out of nowhere with something no one else knows anything about, present a "screenshot" that could easily be faked, and you've at the very least coordinated with someone else to make it look like you're not just a lone crazy. That's fishy as all get out. This page was last edited on 8 October 2018, at 23:27.